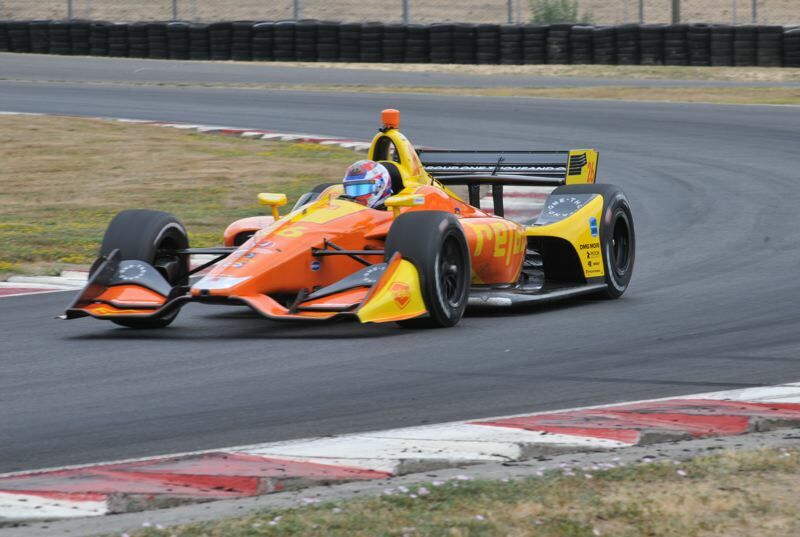 First practice session at Portland international Raceway is to prepare for the Verizon IndyCar Grand Prix set for Sept. 2. 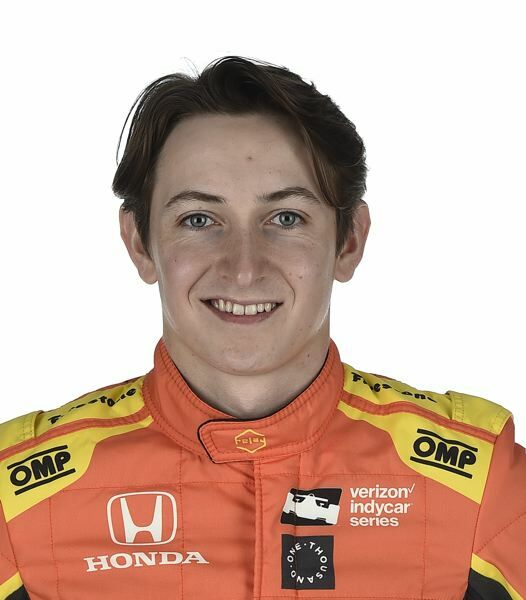 Zach Veach is a 23 year-old rookie IndyCar driver from Stockdale, Ohio. 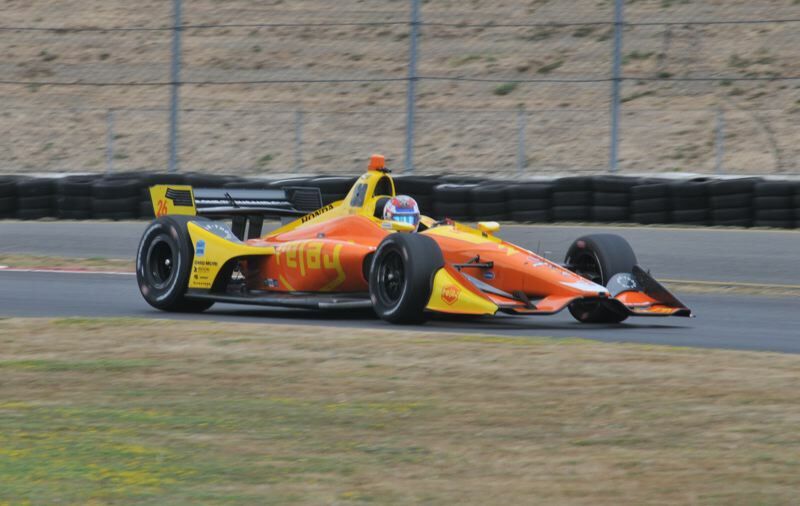 He will race for Andretti Autosport in the Verizon IndyCar Grand Prix of Portland in September, but on Friday, Aug. 3, he was at Portland International Raceway to take his first test laps around the track. "It's my very first time ever visiting Portland," Veach says. "It's great to be here. We've only done a few laps this morning, but this track is already on my top three favorite list." Drivers have been known to say that about every track, but Portland's long straights and flowing, consecutive corners seem to suit Veach's driving style. "It's very rhythmic," he explains. "You don't have this kind of rhythm at many racetracks, where it's three corners strung together with a single entry point. That's pretty fun, especially in an Indy Car!" Veach started karting at 12 in his home state of Ohio. In his pro racing career, He has recorded 13 wins, 14 pole positions, and 39 podium finishes. Veach traveled to Portland to gain some seat time on the track. By investing in this test day, he can clarify his strategy before the race weekend. "I think the main thing's going to be starting up front, to be honest," he says. "I think it's going to be really hard to pass here, just because there are so many fast corners that you really need a lot of downforce, and you need to have clean air, which means not having a car in front of you." Another goal of today's test session is to get the car balanced, with plenty of downforce in the corners, but not so much that the downforce reduces straight-line speed. A well-balanced car delivers a good qualifying time and places the driver up front at the start. "I think if you start up front, you have a pretty good chance of staying up front, but like any IndyCar race, it takes smart choices and some dumb luck," Veach jokes. "My goal is to finish in the top 10; that's been our rookie goal all year. We achieved that the last two weekends in a row, so I'm hoping that we can keep that streak alive." Veach will drive the No. 26 Group One Thousand One Honda for Andretti Autosport at the Verizon IndyCar Grand Prix of Portland on Sunday, Sept. 2. Information about the event can be found at www.portlandraceway.com.